Well, I have been pushing forward with my paper-piecing project. 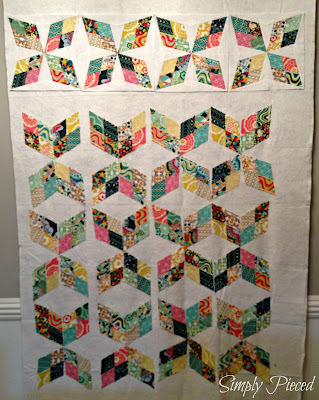 I like the Arkansas Traveler's block since it allows for regular piecing as well as paper piecing. As I continue to work through this project, I'm starting to learn a few things about paper piecing that I can share with you. 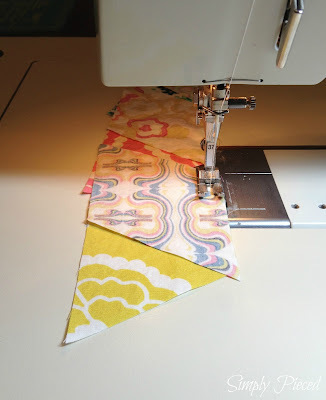 Lesson #1: The chain piecing really helped speed up the process and save me some thread. I had just a few more diamonds to make and I finally got those done the other night. 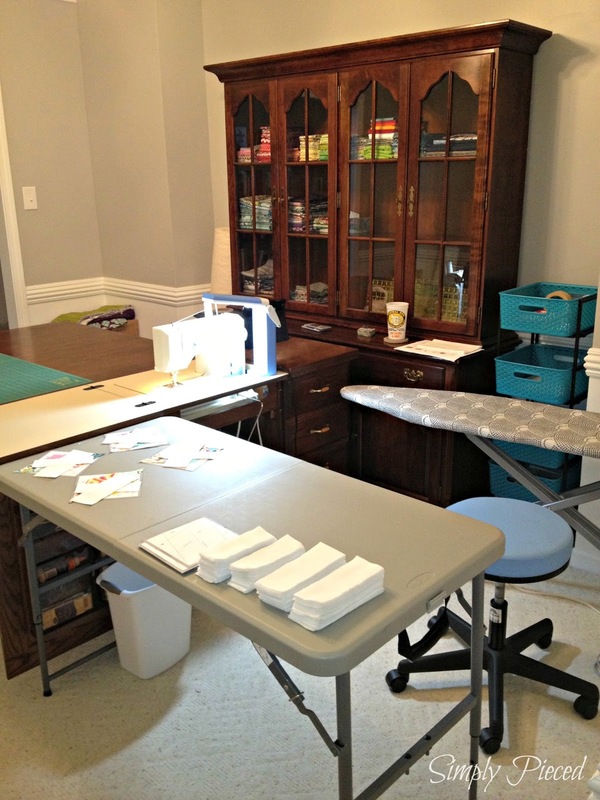 Lesson #2: Having an organized sewing space with your strips laid out and your iron ready to press after each strip sewn really helps. 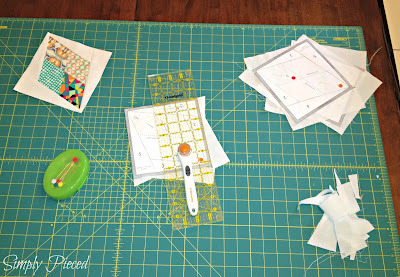 Lesson #3: There are a lot of scraps/trash left over once you trim up your squares. Also, pulling the paper off the back is a bit time consuming and creates a lot of trash. I'm not sure how I feel about this yet. 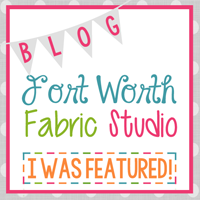 Lesson #4: Having a design wall really helps keep your pattern in order. 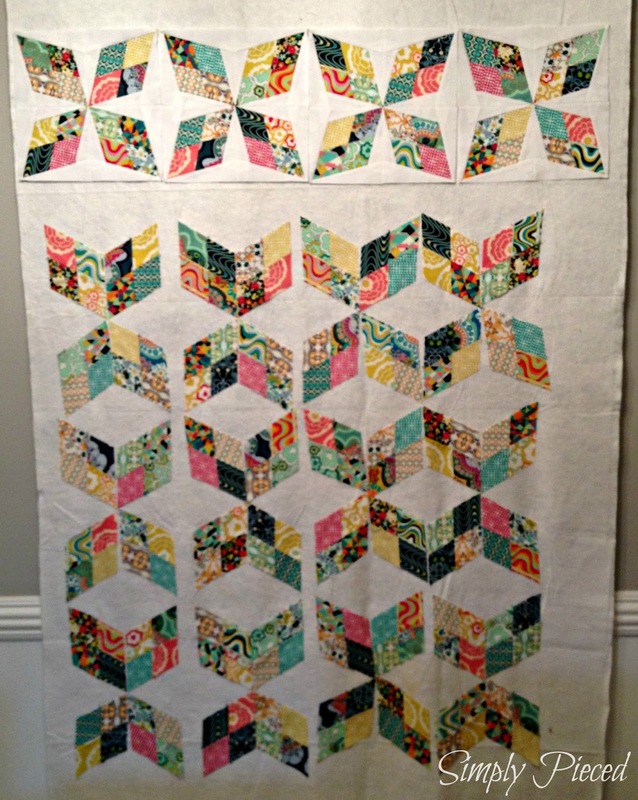 I have my 4 finished blocks at the top and the other diamonds ready to be paper-pieced. Lesson #5: Having a sweet and quiet companion while sewing can calm the soul and make you smile. I'll admit I stopped sewing a few times to scratch behind his ears. Sam comes and stays with us while his owners go out of town. We love him dearly for his patience and gentleness with our children. 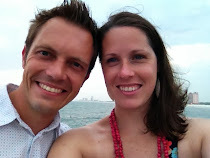 Lesson #6: When your husband does something that makes you proud, shout it out to the world! Okay, I know this last lesson has nothing to do with sewing/quilting, but I can't help but brag on him a bit. 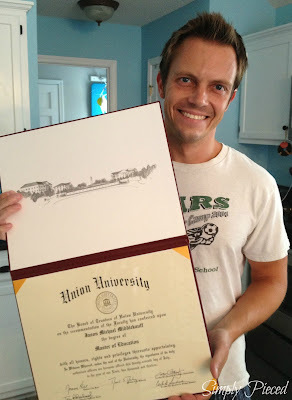 My husband completed his Master's degree in Education and just received his diploma. I'm so proud of his accomplishment. Love the look of these all scrappy on a white background! So cheerful. And congrats to the husband! Fabulous block... it is going to be a great quilt when done. Kudos to the husband. 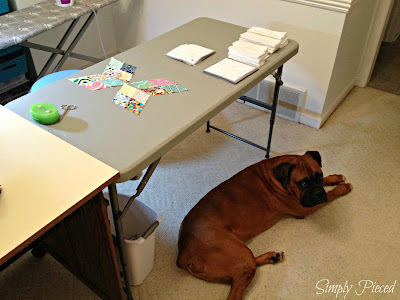 I really love how this is turning out, and love your sweet sewing buddy! Congrats to your husband too! Beautiful diamonds and congrats to your hubby. Well done! Wonderful blocks! I also dislike the paper-bits-everywhere-thing! Your blocks are looking fabulous! 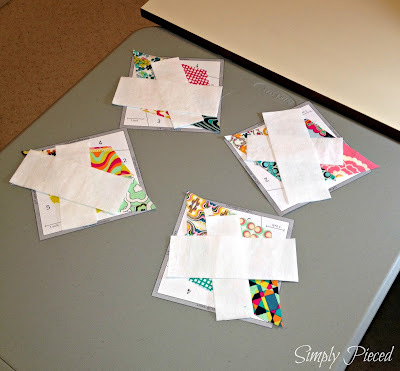 Paper piecing definitely makes a lot of scraps and mess -that's the least fun part of it! Congratulations to your husband! What a great achievement! Beautiful diamonds. And great tips all organized like that. And what a team, your husband and borrowed dog. Congratulations to your hubby! Great accomplishment in a great field! Love your colors in your paper piece project. It can be messy but does make some perfect blocks with great points! It is nice to have a sweet companion. I have a Lhasa that sits outside my quilting studio/office. Most of the time she is content but she has learned that she can bark at me with a shrill once every evening because she wants her treat! Would you say she is spoiled? Anyways your project is wonderful and quite cheerful! Congratulations to your husband! 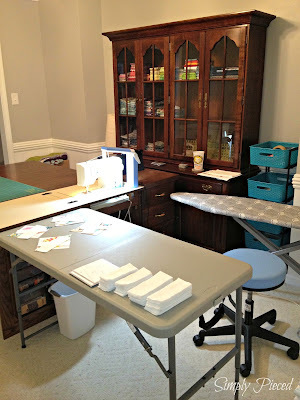 I love your piecing and your sewing companion. I use to have a boxer. She was such a good girl. Congrats to your husband! What an accomplishment! Your blocks are beautiful and I like the idea of piecing and also PP the blocks. Taking the paper off can be a pain. Thanks for sharing. Paper piecing still terrifies me and I've done it a few times. Good job!!! Loving it, I am not sure how I feel about ripping out all that paper either. I am in my first big PP quilt. Now is the fun part, so we will see. Congrats to your hubby! Congratulations to your hubby! And your blocks are looking great. I haven't decided how I feel about paper piecing yet either. The only PP I have done is a few string blocks. LOVE the block and the tutorial is great, I think I can do that one now. AND a big congratulations to your husband, that is a wonderful accomplishment. How awesome! Looks fantastic and love the look of all the blocks together. And yes, congrats to the husband! Yay for the degree finish!!! That's something for a Friday Finish. Definitely! 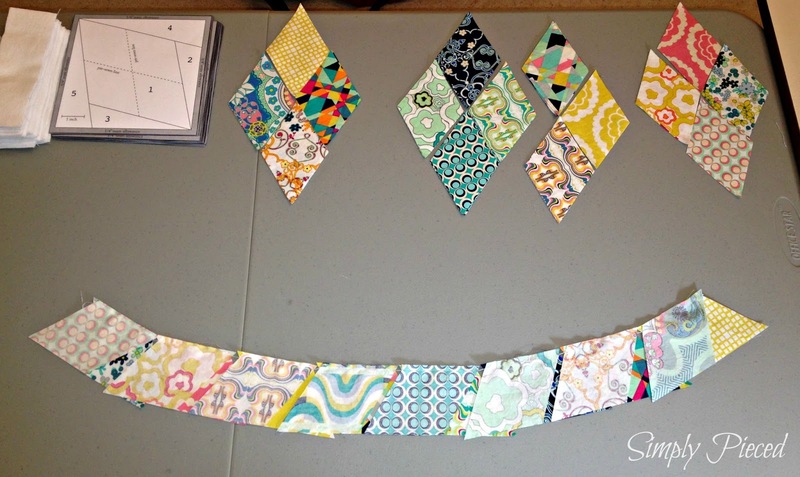 I love chain piecing and an organized method, too. Definitely helpful. Those blocks are fabulous.